Oh Italy, some of the best food, architecture, and apparel in the world! How about a suitcase designed in Italy? The Mia Toro 24″ hardside suitcase is a lovely piece of luggage for the modern traveler. 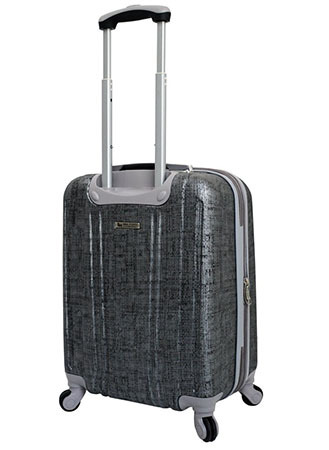 This hardside spinner case offers style and storage for every personal or professional trip. But does it stand up to up the reputation for exquisite Italian design? Read on and find out! 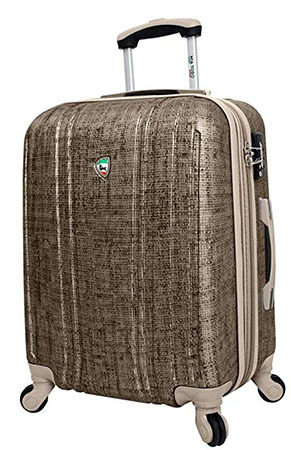 This 24″ spinning suitcase from Italian designer Mia Toro is well-crafted from Armor-flex composite material. The exterior has a speckled canvas finish that reduces the appearance of abrasions. The finish is also easy to wipe down and sanitize. It looks like an expensive suitcase and has the sophisticated flare that you would expect from an Italian design. Neutral colors are beautiful and understated, making this a piece that could easily compliment your other luggage. A TSA lock is provided to keep your valuables safe. A trolley handle with an ergonomic gel grip is provided for comfort and ease. Four multi-directional spinner wheels glide smoothly even when you have to dash through the airport. 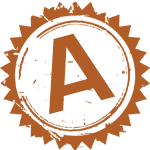 This beauty comes in three neutral colors. Gold, Grey and Blue. The exterior is a canvas texture so the color is not a flat share. Each has lighter and darker specks, making these pieces look refined and rich. Perfect for the modern traveler, this hardside spinner case offers style and storage for every personal or professional trip. It’s book style opening is well suited for packing cubes. 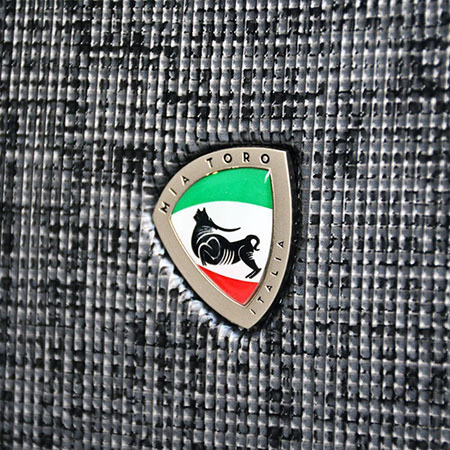 The fully lined interior is made from a soft but durable fabric with the Mia Toro logo. Inside we also have crisscrossing compression straps to keep everything in place. A mesh zippered pocket is great for separating shoes and such. As well as zippered divider on top. If you are someone who likes a lot of built in organization options this may not be the bag for you. No bells and whistles here. Just a simple straight forward empty shell you can customize to your needs with cubes/containers. You could easily pack for a week in this suitcase, and since the material is lightweight you won’t have to worry too much about the weight of your items inside. 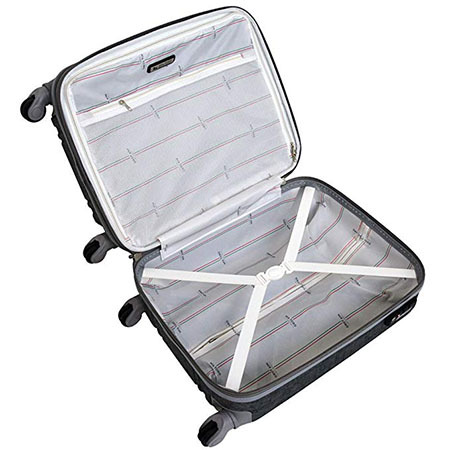 Users report this is a well made suitcase that holds up for years. Even packed to capacity the handles endure. The wheels function as they were designed, smooth gliding over various surfaces. And not only does it hold up in functionality, it stays looking beautiful because of the canvas texture. Scratches remain unnoticeable because of the smartly designed finish. 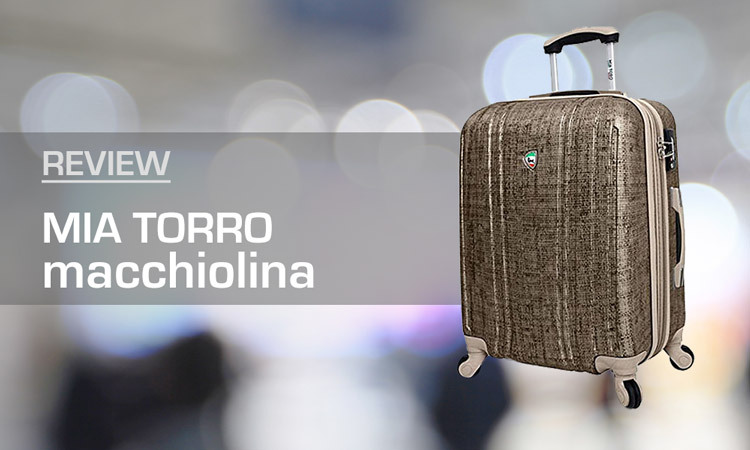 All in all, this Mia Toro suitcase lives up the Italian reputation for excellence when it comes to being durable. At just around $110 on Amazon, depending on sales and promotions this Mia Toro suitcase is a worthy investment. You’re getting a lovely design that holds up well and has simple features that add to your comfort and enjoyment as you travel. I haven’t read anything negative from users yet. The Mia Toro 24″ suitcase is am Italian designed durable well priced piece of luggage with a smartly crafted and gorgeous exterior. It’s gender neutral and classy. It doesn’t have a lot of bells and whistles, but in our opinion it doesn’t need any. It’s just well made and easy to customize according to your likes and needs suitcase. You can pick this beautiful Mia Toro suitcase up on Amazon.